"Game on." That's the attitude Rick Berman has when he looks at the challenge animal activist groups pose for livestock industries. 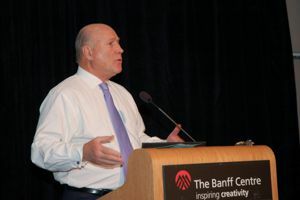 It's a mindset the pork industry, and others in animal agriculture, would do well to adopt, he told a cross-section of producers and industry players at the Banff Pork Seminar. "These advocacy groups are changing the conversation," says Berman, a leading consultant on public affairs and activist issues with Washington D.C.-based Berman and Company. "They are remaking the world in their image. They will keep demanding new changes. And once you change they move the goal posts again. We know where this is going - you can't legitimize them or reason with them. You need to take back control and have an offense strategy." Berman sees these players as part of a broader rise in activist groups. Each is unique but tends to focus on one of three areas - issues related to labour, food, or energy and environment. "What are these groups about, really, and where are they taking us?" says Berman. "That's where we need to drill down and focus." Groups such as PETA and Mercy for Animals are transparent as activist groups focused on "animal rights," he says. HSUS and its true agenda have been harder for the public to recognize. This organization has maintained a front focused on animal welfare and humane care, but make no mistake, says Berman, it is in lock step in viewpoint and agenda with the animal rights groups. Statement such as "the meat industry equals systematic murder" are part of its rhetoric. "Is this really a group you can negotiate with?" says Berman. "We're talking about people who represent a vegan culture, who are basically equating animals with people and advocating an end to eating meat. It's animal rights and an extreme agenda masquerading as animal welfare." If HSUS disclosed its true agenda it would be out of business, he believes. But by portraying itself as a welfare organization and manipulating the public consciousness, it has become a gargantuan money machine collecting over $130 million annually to support its true anti-meat agenda. "Groups like this are constantly looking for ways to make their points seem legitimate and mainstream, to get the support they need to advance their own self-interest and true agenda," says Berman. In the case of HSUS, people believe a lot of what this organization does is support humane shelters. In reality, less than 1 percent of HSUS funding goes to shelters, says Berman, while greater than five percent goes to the organization pension fund. The vast majority goes to campaigns, lobbying and related efforts aimed at continually demonizing and reducing meat production. A huge chunk of HSUS dollars from public donations go to staffing its ever-growing army of lawyers. "My issue is, who gave these people the mandate to be achieving their goals? They are not elected or appointed by an elected body. They simply mislead and manipulate, to collect money, affect opinion and advance an agenda that many people who support them do not understand." Major retailers and some industry organizations that have worked with HSUS to make agreements on changes are making a huge mistake, he believes. "They are not a real reflection of what the public or consumers want. And once you agree to one change, they just keep going and asking for more. You can't satisfy people whose end goal is the abolition of animal agriculture." There are legitimate animal welfare and care improvements industry has made and will continue to make, he says. "But be careful. Make sure the reasons you are changing are the right ones. Keep a strong relationship with your consumers and don't' let you or them get caught in someone else's agenda." Livestock industries need to get far more aggressive in exposing the true nature and aims of the activist groups, he says. That's starting to happen with efforts such as www.humanewatch.org. "The bottom line for me is there's a scam going on here," says Berman. "People need to see what the HSUS is really about." The leading animal rights groups are masters of the public opinion game, he says. They know how to reframe issues, reposition opposition and diminish moral authority. Livestock industries need to compete at the same game. "Their game is all optics, not facts," says Berman. "We need to hold a light up to that and let the public see what's really going on." Winning the PR battle will not be easy and will require substantial effort, he says. "What's the cost of winning? I don't know. But I can tell you it's much cheaper than the cost of losing."